The number of realized Active Houses has already proofed that it is possible to make energy efficient buildings without compromising good indoor climate and building components lowering environmental impact. 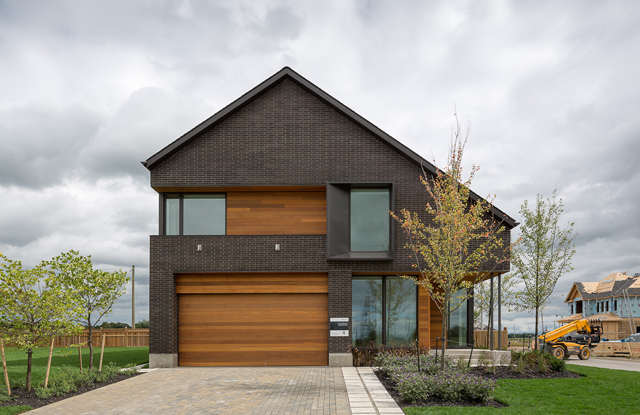 Last year the new Active House came to Canada, the building scores excellently in all of Active House categories which is an achievement taking into account that many already popular in Europe building techniques, components – are not yet common in Canada. 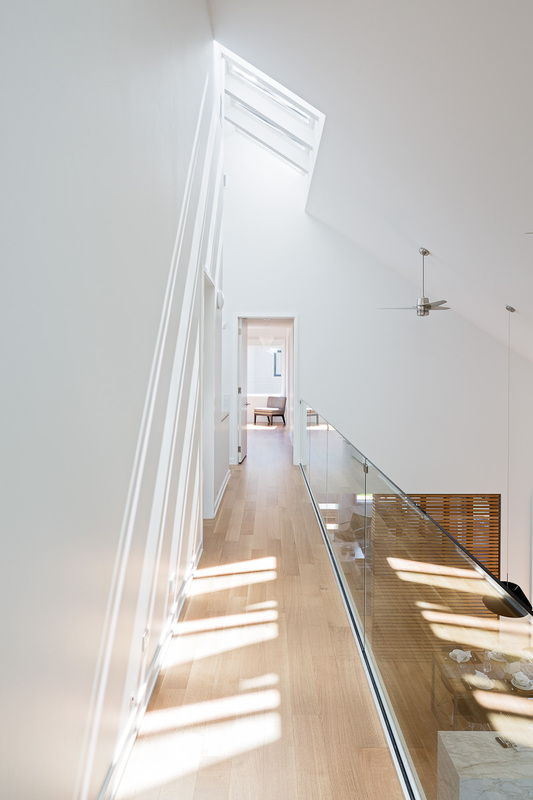 The fundamental qualitative aspects of the Great Gulf Active House are guided by natural daylight and how it can soothe and otherwise improve our daily lives through an immersive experience. 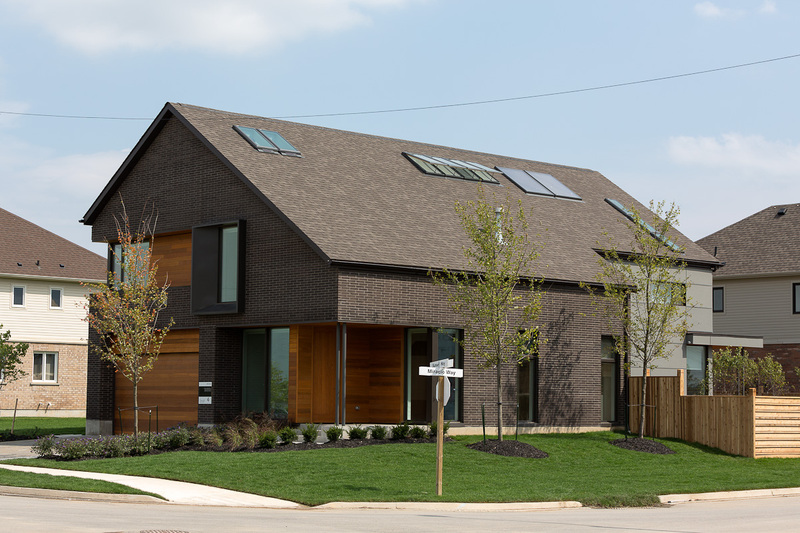 The Great Gulf house was built in Thorold, Ontario, a community located in the Niagara Region and roughly 90 minutes west from Toronto, this demonstration building was achieved through a collaboration involving a team of Danish architects, the award-winning Toronto architecture firm Superkül, and Great Gulf, the builder committed to bringing the Active House concept to Canada. Using the design guidelines of a traditional gabled roof design and adapting them for the Active House yielded a streamlined multi-functional roof design that provided a basis for double-height spaces and opportunity for excellent daylight conditions provided by multiply windows. The house is oriented with the long roof slope and major glazing facing south to maximize the efficiency of the solar hot-water system and passive solar gain. 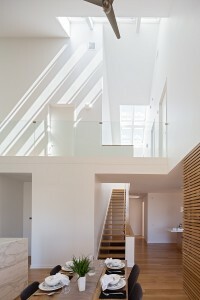 Two intersecting axes guide the open plan of the interior to maximize cross breezes. By removing visual barriers between living spaces, the open plan also creates the impression of a larger home. 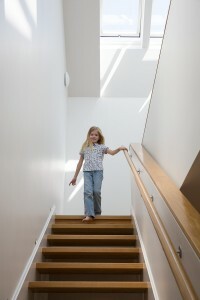 While developing the concept extensive daylight simulations were made to avoid insufficient levels of natural daylight in nearly every space of the home. The architects were able to maximize direct and indirect light, which can be reflected off of walls, ceilings and the white hardwood strip flooring to help increase light reflectivity, by selecting the most efficient sizes and the most effective locations for façade windows and skylights. Fully integrated systems optimize not only the natural lighting but also the air quality. Natural ventilation is encouraged by a dual-zone HVAC system connected to a Somfy Tahoma Smart House system that uses sensors to automate the windows, two heat-recovery ventilation (HRV ) units supply the house with fresh air. A greywater heat-recovery unit captures heat from showers and baths and preheats incoming cold water. A cistern and rainwater collection system reduces the need for municipal water up to an estimated 35% and lessens the load on the municipal waste water system. The house is run on 100% renewable source energy. The use of innovative construction method/ prefabrication of building components as exterior walls, roof and floor systems contributed to low environmental impact of the house. The method reduces material waste and energy usage. The architectural intentions that define the Great Gulf Active prototype have enabled the architects, investor, and product manufacturers, opportunities to measure and study the Active House’s performance, improve upon it, and then implement the necessary modifications before building next generation of homes.